Now that our roads are not covered in ice, I've started running again. I love being out there, running, and I really love the feeling when the run is over and I go through the rest of the day feeling strong because I ran. It's hard to find time to run, though. I try to run three times a week, one of which is usually on the weekend. The other two runs are a little harder to schedule and for a long time I just didn't exercise at all because I couldn't see when I could fit it in. With encouragement from Paul, who is also running, I've started just taking the time, heading out as soon as the kids I babysit are gone home. Supper is often later than we had been used to, but no one seems to mind. 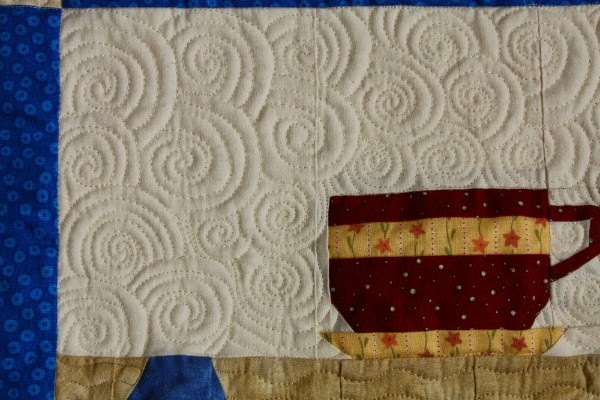 I take time for quilting too. 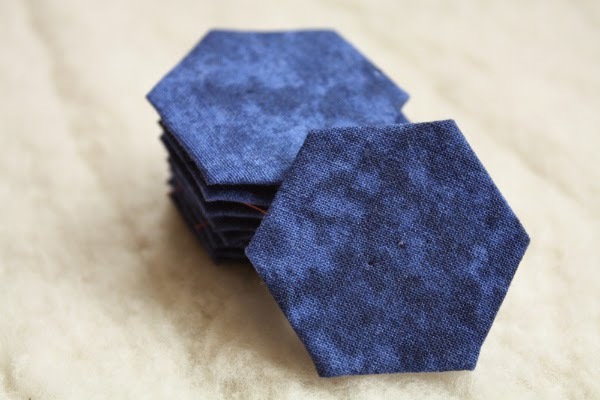 I'll squeeze in a few minutes basting hexies, or set up my machine while Nathan's getting ready for bed so I can sew for the evening. 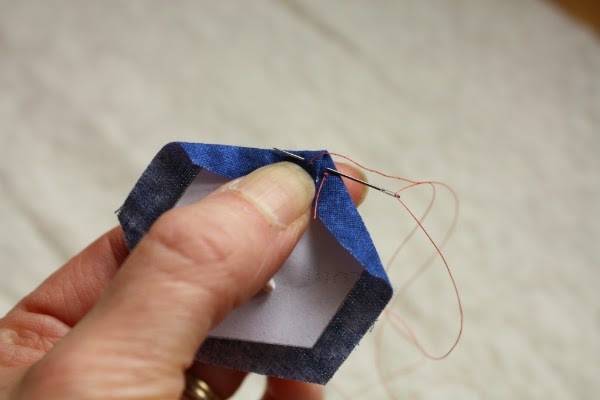 If I can't actually be stitching something, I will at least look through a quilting magazine or read some blogs to see what others are making. There will always be things we want to do and things we have to do. Often the things we have to do take up way more of our time than we have available for the things we want to do, but there are ways to juggle tasks around to take time for the things we consider important. A little rearranging of meal times and I have time for a run. 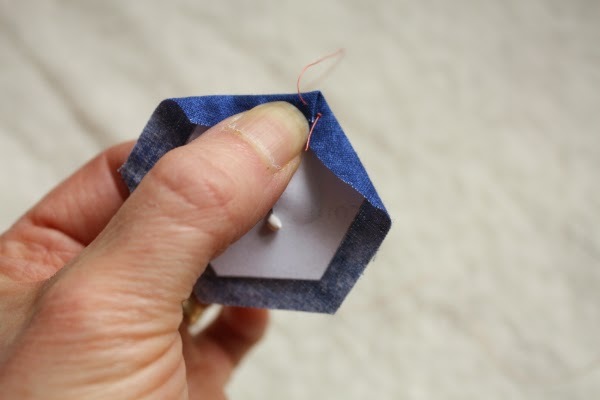 Having some projects that are easy to work on in little bits of time makes it easier to do a little sewing even on busy days. I've been reading through the Gospels lately and I find it interesting that Jesus had to take time for something too. "One of those days Jesus went out to a mountainside to pray, and spent the night praying to God" (John 6:12). Jesus was a busy man. He had His disciples to teach and wherever He went He attracted crowds who sought His teaching and His healing power. He needed to spend time in prayer, but His days were too busy, so He spent the night praying. I'm sure this was a sacrifice physically. We know that, as a man, Jesus got tired just as we do. In fact, He once slept in the back of a boat while a storm raged around them (Mark 4:35-41) which suggests He must have been exhausted. His willingness to spend an entire night in prayer tells us how much He valued that time with His Father. There are other records of Him taking time to pray. Mark 1:35 - "Very early in the morning, while it was still dark, Jesus got up, left the house and went off to a solitary place, where he prayed." Luke 5:16 - "But Jesus often withdrew to lonely places and prayed." Matthew 14:23 - "After he had dismissed them, he went up on a mountainside by himself to pray." I am challenged as I think about Jesus taking time away from His sleeping hours to pray. I don't spend as much time praying as I would like, mostly because I find it hard to have the time. 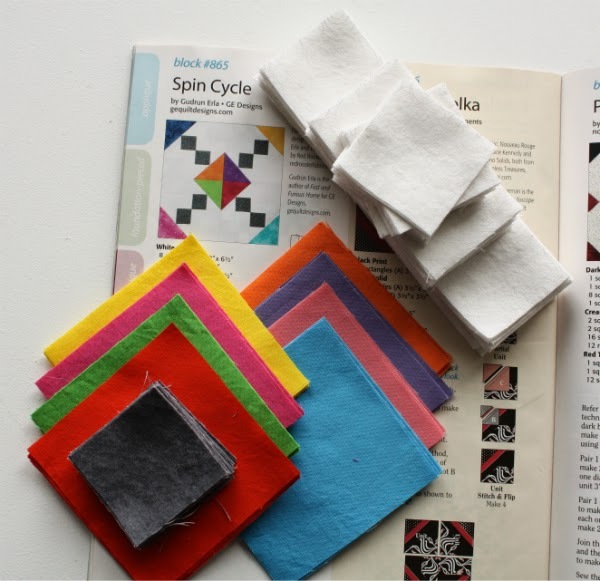 Yet I am able to take time from other things to run, to quilt, even to read blogs. What does that say about my priorities? I am wondering now what adjustments can be made to give me time to spend in prayer. What about you? Do you pray as much as you would like? Do you have to make an effort to take the time to do so? I finally have a finish to share! It had started to feel like a long time since I finished anything, and then I realized that's because it has been a long time...this is my first finish this quarter. Yikes! I made these placemats a couple of years ago. 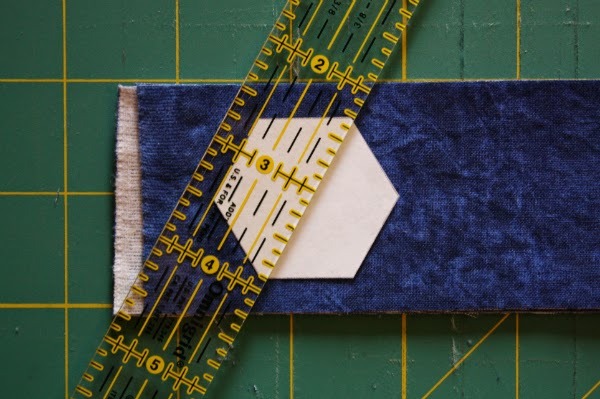 It was my first time designing anything and, even though they're fairly simple, I was so excited when I sewed the first one together and found I had all the quilt math right. I know, it's easy to make me happy. I wanted to make another version of them and actually write the pattern this time, so I made a set of four like this. There is one big difference, which is the size of the large pinwheel. In the original set, it was a 12" pinwheel. 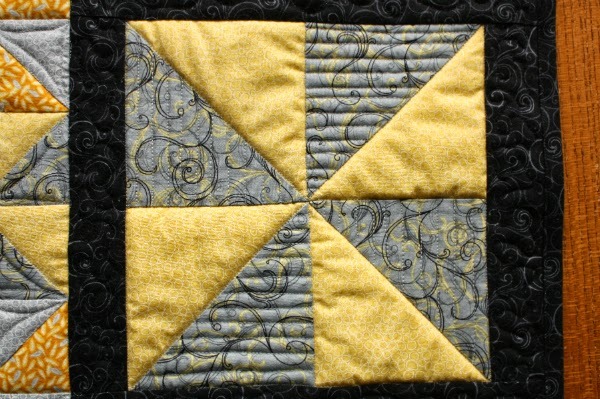 This time I used a fat quarter bundle from Connecting Threads and a fat quarter isn't large enough to make four 12" pinwheels. So, it's 8" with a border. I quite like the new look. and this freeform pinwheel in the small ones. I also stitched in the ditch around everything and stippled in the black border. 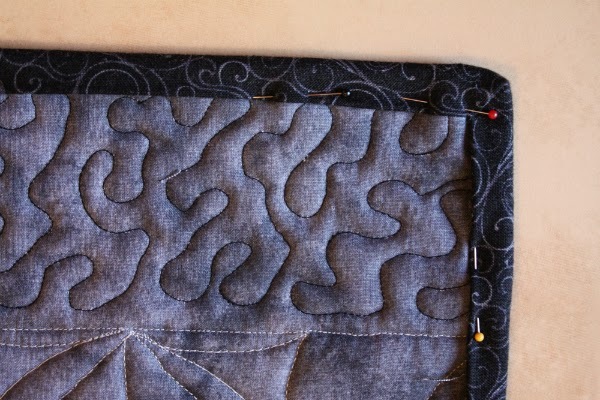 I love how the quilting looks on the back. Then I tried something new. I've always machine stitched my bindings to the front and then hand stitched them to the back, but I've been seeing a lot of pretty machine bindings online lately and decided to give it a go. I started off by making a mistake right at the start. Machine bindings should be sewn onto the back first so the last side stitched (which ends up looking the neatest) is the front. Yep, I stitched mine to the front first. I could have ripped it out and started again, but I didn't. Too lazy. 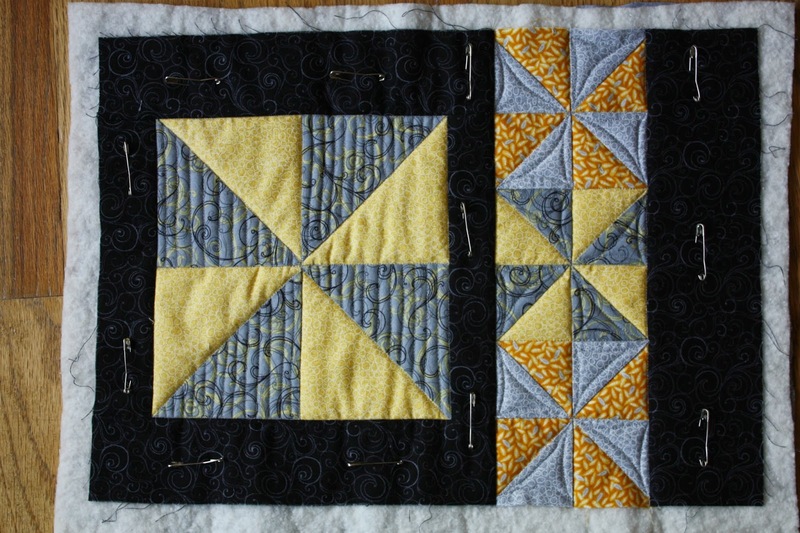 Once I was finished the first side, I pinned the binding to the back all the way around. I found this worked nicely and kept things from shifting out of place. Now I see the appeal of the binding clips! 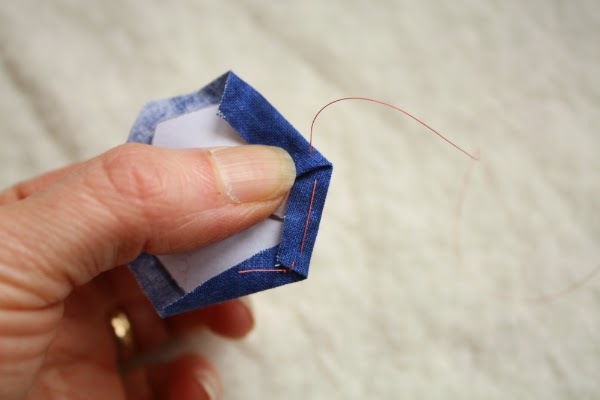 On something this size I didn't find I stabbed myself very often as I stitched the binding, but I think it would be a different story with a large quilt. Then I stitched slooooowly! That helped a lot. It's certainly not perfect, especially around some of the corners, but all in all, I'm pleased with the machine binding. I'll be doing it again, especially for projects I want to finish quickly. 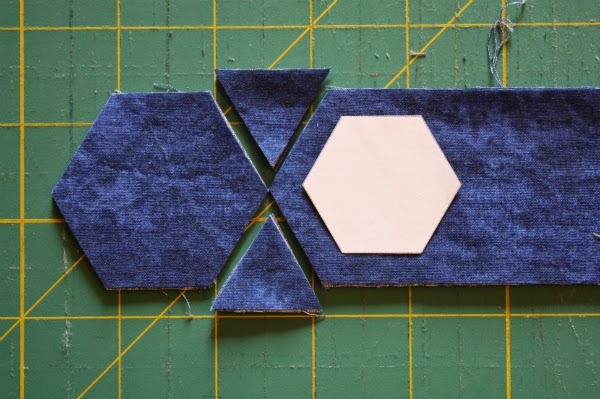 I'm still working on the pattern, but if you're interested in testing it for me, please let me know. You can leave me a comment or email me at piecefullydevoted at gmail dot com. 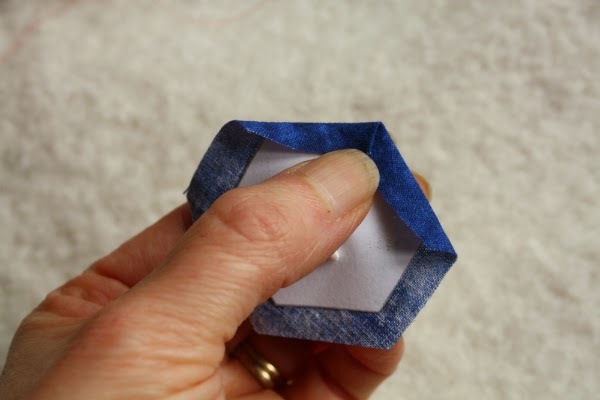 I'll be linking up with My Quilt Infatuation, I Quilt, TGIFF, Can I Get a Whoop Whoop and Finish it up Friday and YOU Made it and Love It. 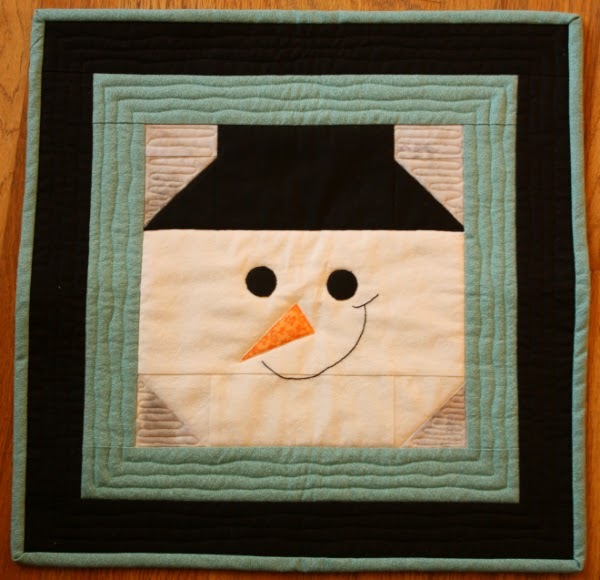 I chose my Portrait of a Snowman quilt as my second entry in the Blogger's Quilt Festival hosted by Amy of Amy's Creative Side. 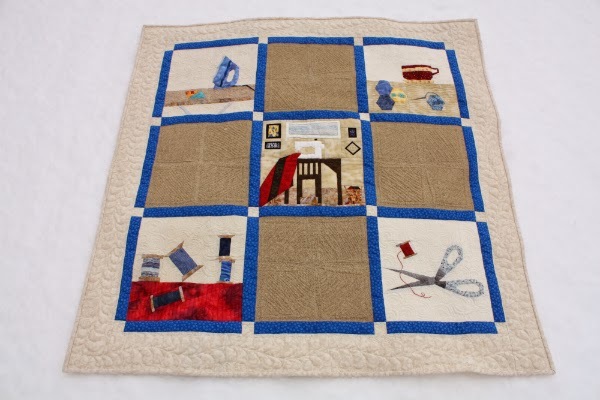 I am entering him in the Original Design Quilts category. I love how much personality this snowman has. Funny thing is, I made two and gave them both away. I guess I'll need to make myself one before Christmas comes around again! 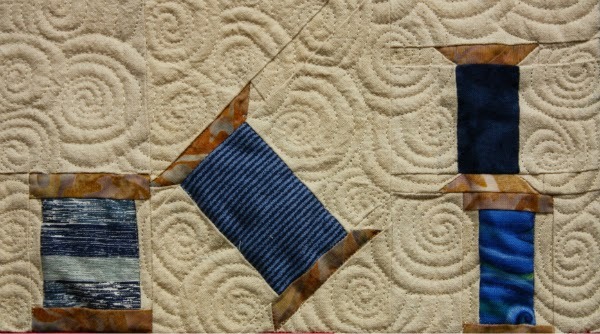 This is the first time I've ever participated in the Blogger's Quilt Festival hosted by Amy of Amy's Creative Side. 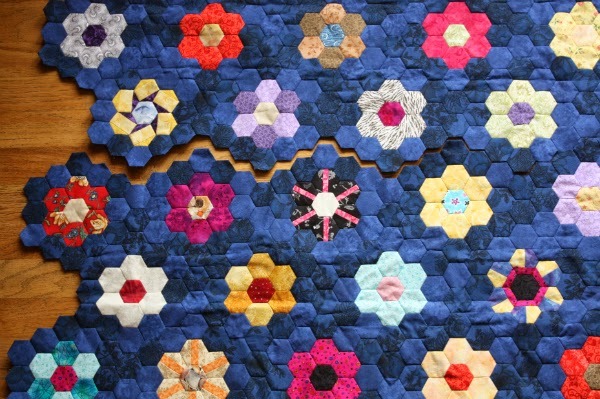 I'm really looking forward to seeing all the amazing quilts and finding more blogs to follow (even if I sometimes feel like I can't keep up with the ones I already follow!). 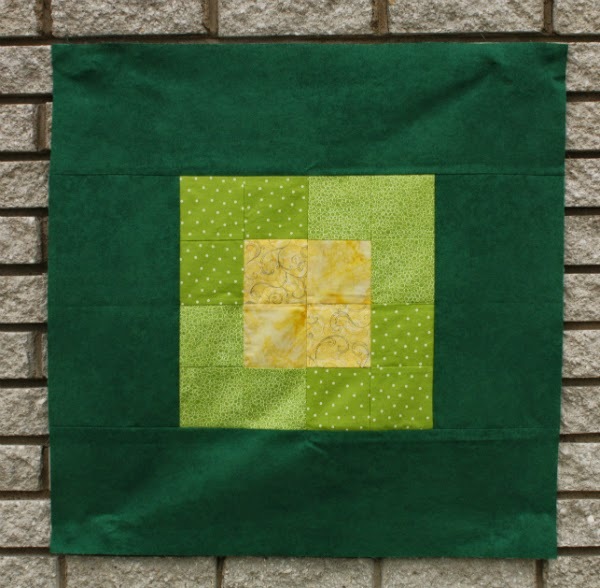 I'm entering my And Sew On wallhanging in the Home Machine Quilted category. 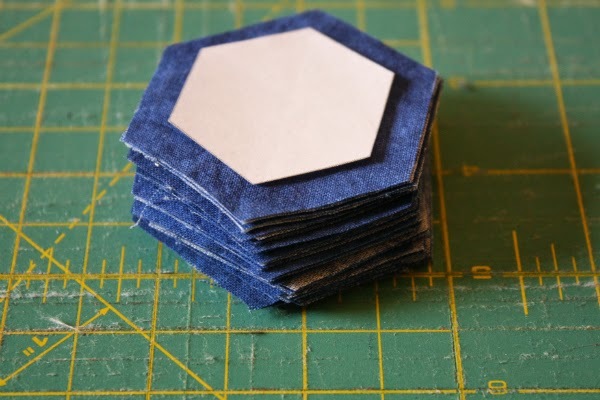 The paper pieced blocks were designed by Kristy at Quiet Play and they were so much fun to put together. 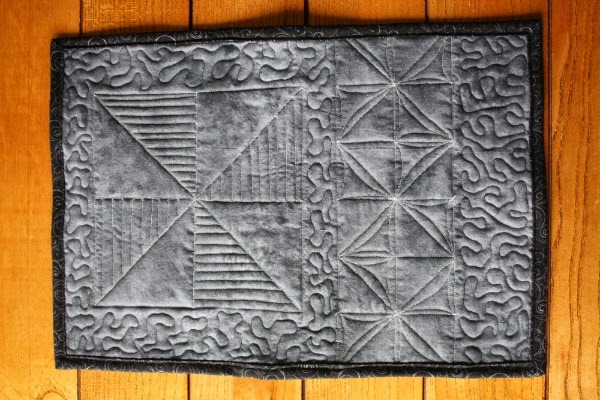 This quilt could have fit in a couple of other categories (small quilts and scrappy quilts), but I chose the home machine quilted category because I'm so proud of the quilting on this one. 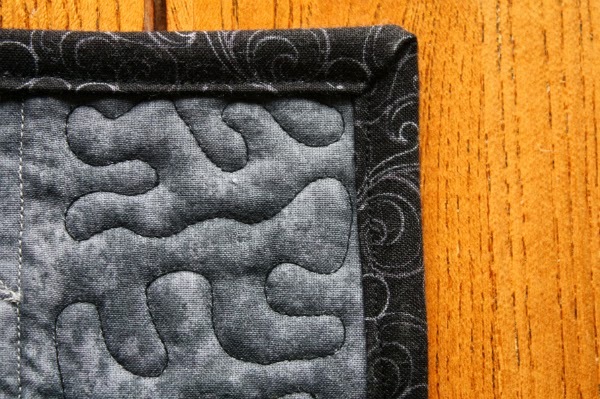 It was my first time quilting this type of spiral. I drew a few on paper and then dove right in. If you look in the bottom left corner of the teacup block you can see where I messed up with the first couple of spirals, but after that I figured out the right path to follow. 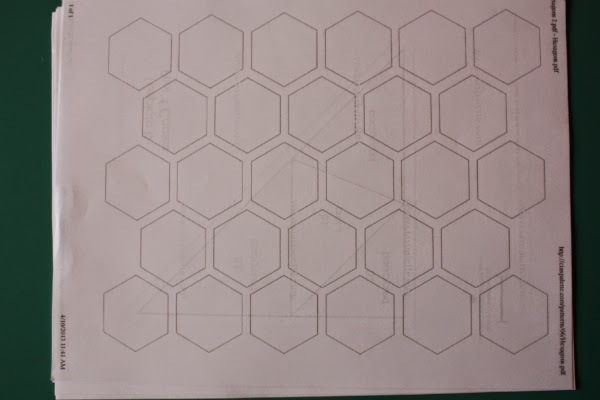 I finished the block and sat staring at it, so excited that the spirals looked like spirals! They're not uniform, or even close to it, but I love them. 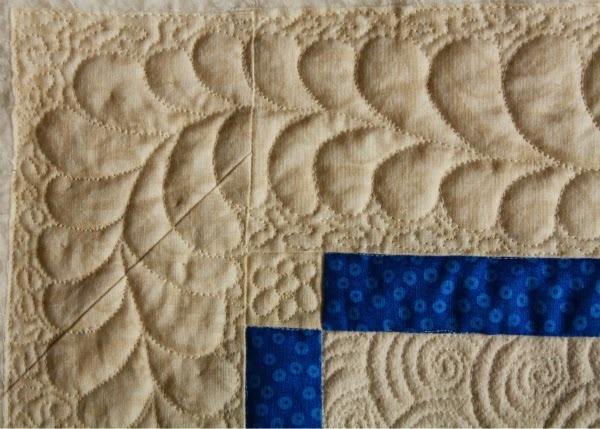 This quilt was also the first time I did large feathers all around the border (shown here before I put on the binding). Again, they're not perfect, but I love them. I am sure there will be more feathers like this in my future. Thanks for stopping by! Thanks also to Amy for organizing and hosting this great festival, and to all the sponsors. 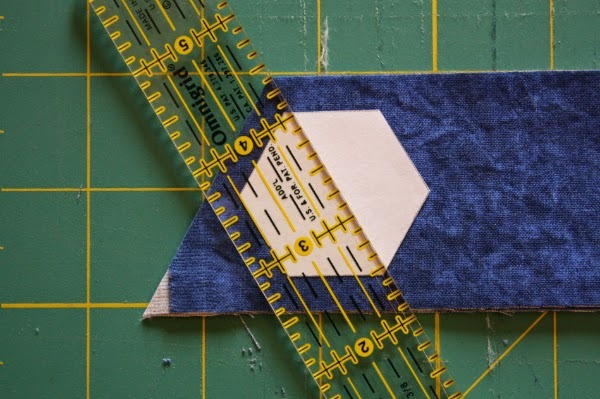 The talented Leanne at She Can Quilt has designed a fantastic pattern called Canvas and I was so excited to get to test it for her. Here is my version. This pattern was super easy. I spent about twice as much time picking out the fabrics as I did actually putting it all together. Even so, I went from rummaging around in my stash to completed quilt top in only a couple of hours. 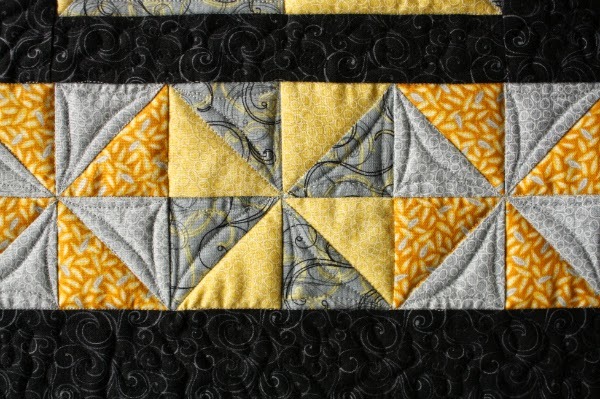 The pattern calls for four different center fabrics and four others for the second row. I kept picking out fabrics and then realizing I only had three that would work for one row or the other. It was very frustrating since I wanted this to be a no-trip-to-the-fabric-store project and in the end I went with two for each row. I quite like how it turned out. 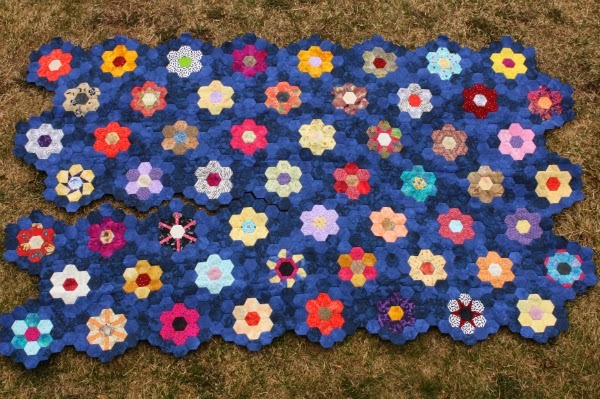 I plan to quilt this using my Fine Line Quilter's Rulers that I ordered after reading a review by Marelize of Stitch by Stitch. 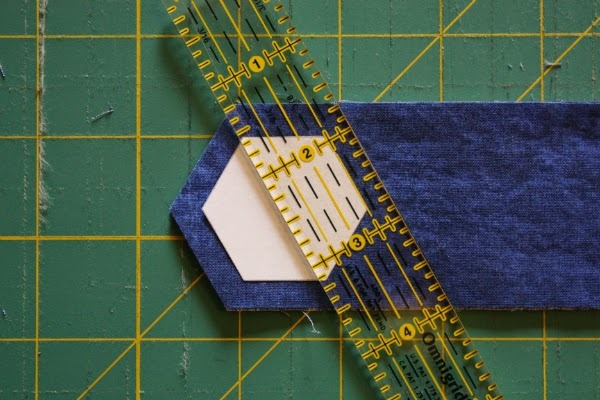 So far I've only tried my rulers out on a bit of scrap fabric, so I'm excited to give them a real test. Linking with Lee at Freshly Pieced, Lorna for Let's Bee Social, Kelly at NTT and Gemma for I Quilt. 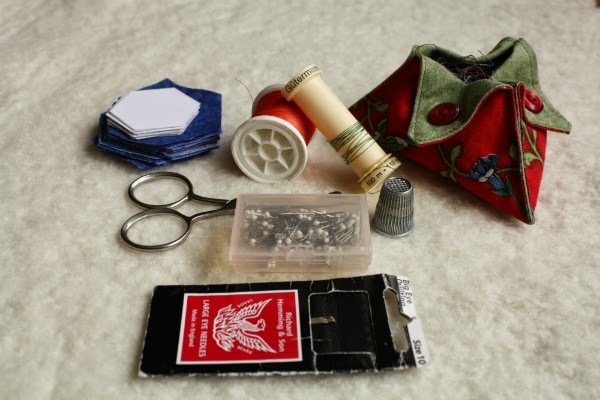 It's Sew Mama Sew Giveaway Day (week) again! I meant to make something to give away, but I forgot until about two days ago. Oops! 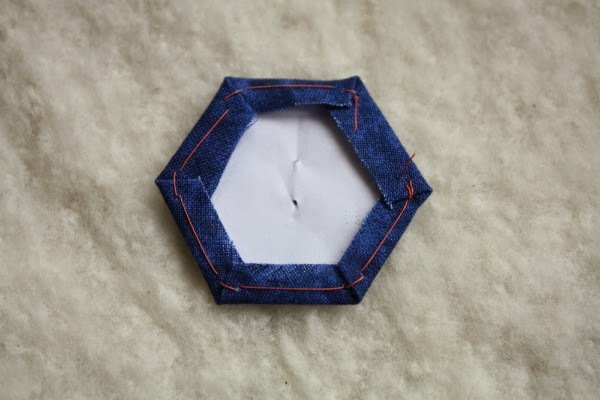 Since I don't want to miss out on the fun, I'll give away a copy of each of my patterns instead. 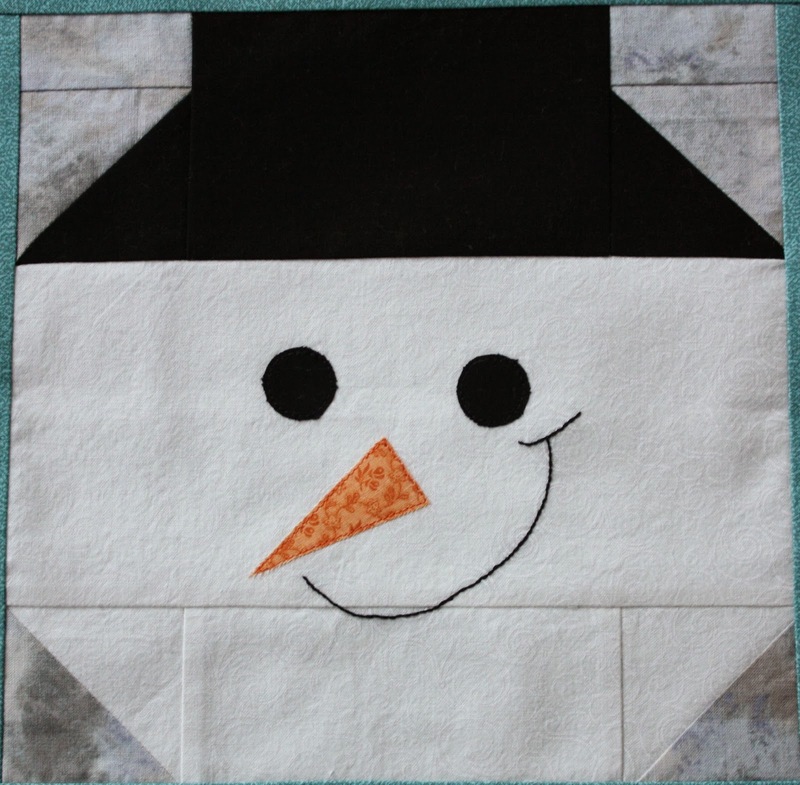 My first pattern, Portrait of a Snowman, is for this adorable snowman block, which finishes at 9". He'd be so fun to customize, wouldn't he? My pattern tester used buttons for the eyes and nose, added snowflake buttons to his hat and even gave him a bowtie! I know May isn't supposed to be snowman weather, but it did snow here again today. Not enough for a snowman though! My second pattern is for this Happy Birthday banner, which finishes at 28 1/2" x 36". 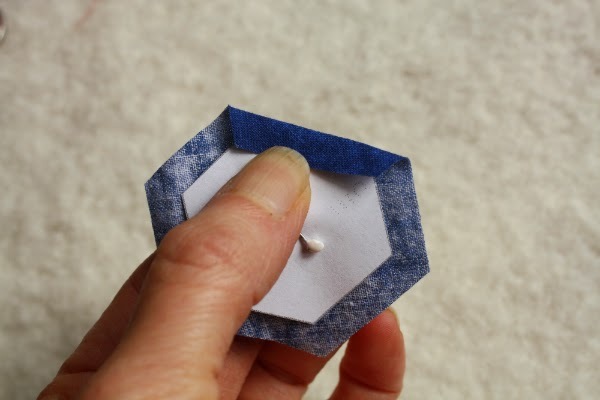 It's a quick project and adds a quilty flair to birthday decorations. This giveaway will stay open until Friday May 16th. Anyone can enter since the patterns will be emailed to the winner, but make sure I can contact you if you win. Leave your email address in your comment if you're a no-reply commenter or I will have to get Mr. Random to pick another winner. 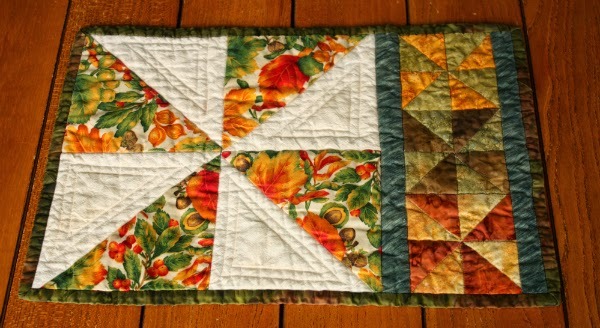 To enter, leave me a comment and tell me about your favourite holiday quilt. 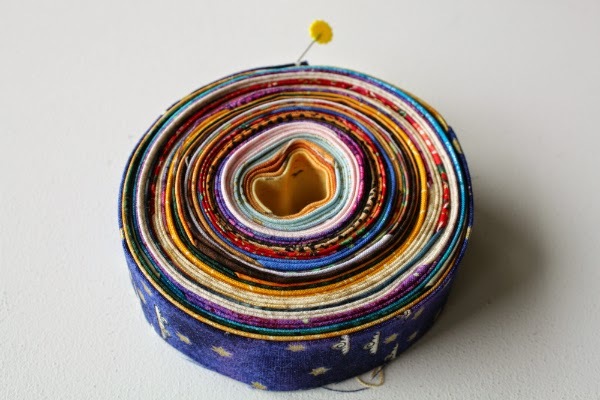 It could be one you made, one someone else made for you or just a pattern you love and hope to make someday when you finally have the time. 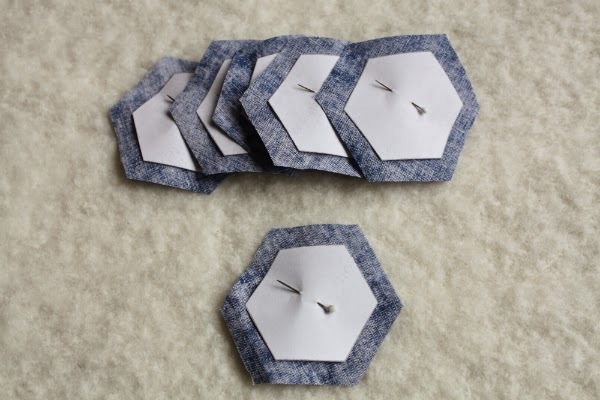 Don't forget to check out all the other giveaways at Sew Mama Sew! I've heard it said that being a mom is the most rewarding and the most relentless job on earth. I don't know if any mom would argue with that. There's nothing quite like a toddler wrapping his arms around your neck and saying, "I wuv you." Or like watching a child learn to decipher the letters on a page so he can read a story to you. Or seeing an older child find an interest that drives him to learn and learn, until you find you're learning from him. On the other hand, there's nothing as all-consuming as caring for a sick child who wants to do nothing but cuddle in your arms, not even wanting to let go long enough for you to take a bathroom break. And I don't know if there's anything as exhausting as dragging yourself out of bed, again, at 3 am because the baby is crying, again. Being mom comes with an ever changing array of concerns. Moms with young children worry about how much their children eat, and what they eat. They worry about getting their little ones to share, and sometimes they wonder if their child will ever understand that the whole world does not revolve around them. Mothers of older children worry about bullying and homework and how their children are doing socially. And even when their grown children have children of their own, moms still worry. They worry about their child's relationships, their finances and their general well-being. Parenting is a life-long job, even when the actual raising of the child is complete. So, every May, Mother's Day comes around and we are reminded we should thank Mom for all her hard work and her concern for us. According to the stores, the best way to thank Mom is with a card and a gift. Restaurants prefer we treat Mom to a meal out, while florists think a bouquet of flowers would be just right. 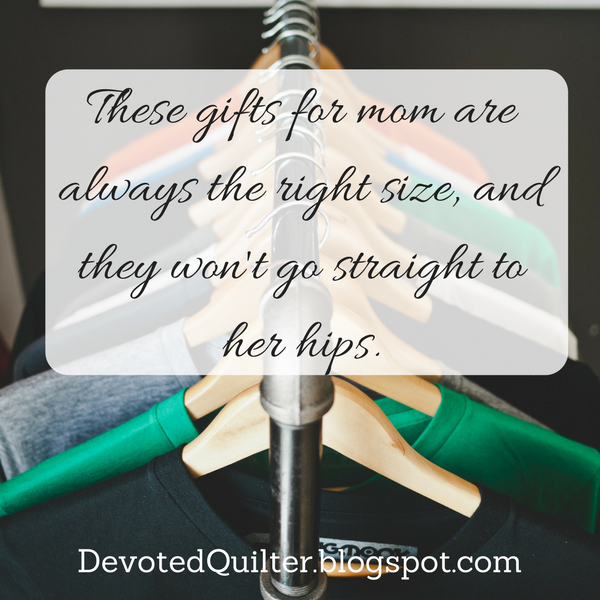 The best gifts, of course, are matched to Mom's preferences, and there is no one item in any store that is perfect for every mother (though chocolate comes close!). There are some gifts that we can all give to our mothers, though. These gifts always fit, they're never the wrong colour or the wrong model and they won't go straight to her hips. They can be given to moms in their 20s, 30, 70s...they can even be given to the memory of mothers who have passed away. We'll start with Ephesians 6:1, which says, "Children, obey your parents in the Lord, for this is right." We understand that children living at home are expected to obey their parents, but what about the rest of us? We don't live at home anymore and we're old enough to make decisions for ourselves. But Proverbs 1:8 says, "Listen, my son, to your father's instructions and do not forsake your mother's teaching." Every time I think to bite my tongue when I want to say something unkind, I'm obeying my mom. Sure, she's not watching over me to be sure I'm doing the right thing, but obedience to the expectations she had for me as a child governs my life today. I pray the same will be true for my boys when they are grown and deciding for themselves how to live. Proverbs 29:17 says, "Discipline your son, and he will give you peace; he will bring delight to your soul." What earned you discipline as a child? Was it telling lies, ignoring your chores, being mean or selfish? Maybe it was staying out past curfew or talking back. Being disciplined is awful. "No discipline seems pleasant at the time, but painful. Later on, however, it produces a harvest of righteousness and peace for those who have been trained by it," (Hebrews 12:11). Living according to the discipline you received as a child is linked with obedience. It will bring peace and delight to the one who worked to instill your ability to share, your work ethic, your honesty and your respect for authority and the rule of law. The next gift comes from Proverbs 31:28, 29: "Her children arise and call her blessed; her husband also and he praises her: 'Many women do noble things, but you surpass them all.'" Do you tell Mom how wonderful she was, and still is? As toddlers, my boys sometimes said, "You're my best mom ever!" Now that's high praise! Even if your mom is a grandma, or even a great-grandma, I'm willing to bet she'd still love to hear what you think she did right. For those of you whose moms are no longer here to listen to your words of praise, there's no reason to stop sharing them. What better way to praise her than by sharing the stories of the wonderful ways she showed love, or about how you laughed together when she once put a full cup of butter in a recipe that only called for a tablespoon. My mom is a great cook, and she assures me that Lobster Newburg tastes wonderful, but it was truly awful the first time she made it! So when Mother's Day arrives, give Mom a call, or send a card, or take her out for supper. But don't forget these other gifts. They won't go out of style, they won't be returned and they won't sit forgotten in a bottom drawer. Best of all, these are 365-days-a-year gifts, so Mom can feel the love in July and November as much as she does the second Sunday in May. And Mom, I love you. You're my best mom ever! I spent some of the morning on the sashing feathers for my scrappy log cabin. I'm down to only 28 left to go! Before putting it away, I flipped it over to look at the back. Isn't that pretty? All that texture is wonderful. I would have left it draped over the kitchen table like that if Nathan weren't coming home for lunch. After lunch Nathan went out to play with a friend from next door, so I kept right on sewing. I switched to these pinwheel placemats. I had been thinking about starting a Placemats of the Month series since I have a bunch of design ideas, but I can't commit to that yet, so I'm sharing these now. 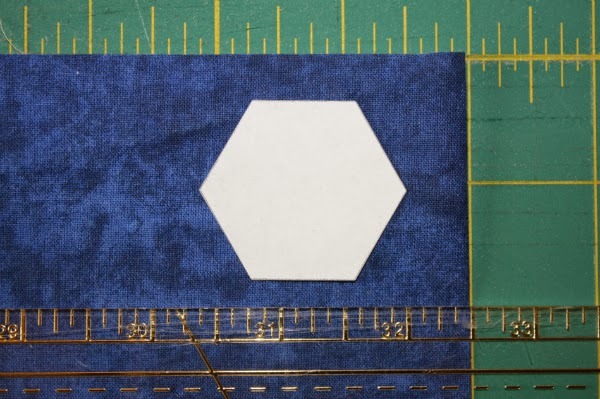 I had the placemat tops finished, so I basted them and started the quilting. 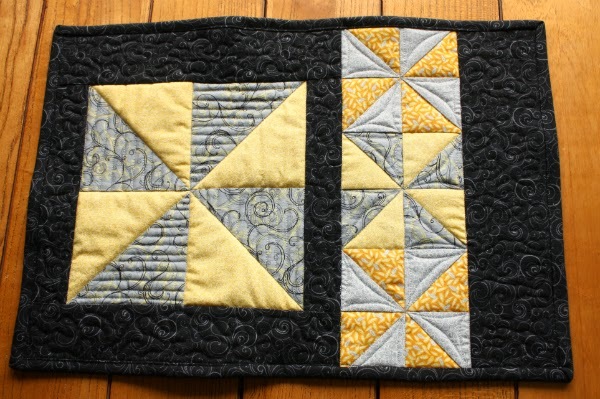 Two of the four placemats are quilted in the pinwheel sections. 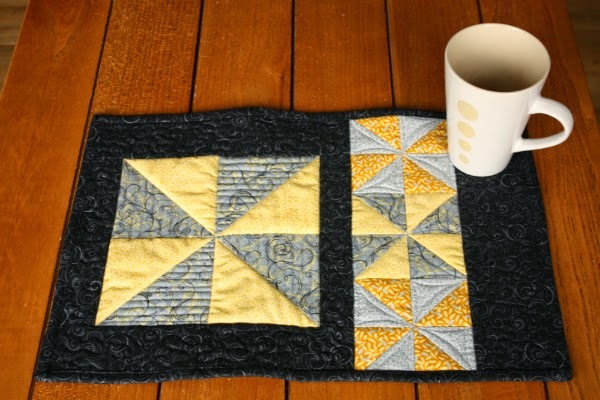 I plan to quilt in the black too, but I'm not sure what to do there. Just stippling maybe? 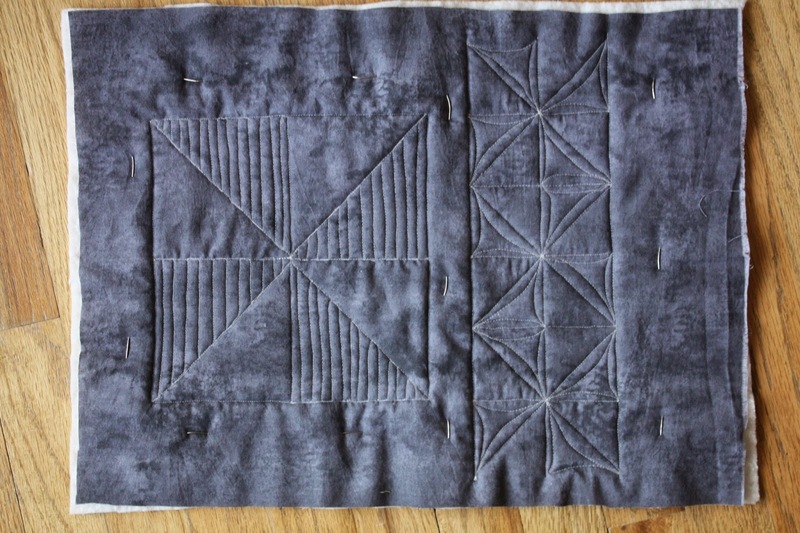 I used a mottled dark grey for the back and I love how the quilting shows up. This is the view out my kitchen window. See the ice still in the bay? See the open water to the left? Slowly, but surely, the ice is breaking up and it's starting to look more like spring. On my run last weekend I could actually smell the salt water for the first time all year. Whoo hoo! And I saw flowers yesterday - they were dandelions, but at this point a flower is a flower! 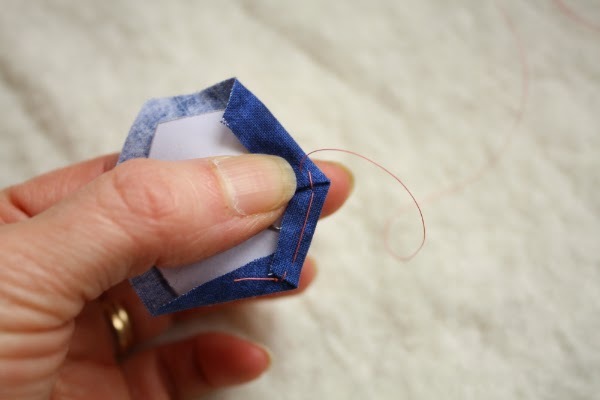 I'm linking up with Sarah at Confessions of a Fabric Addict because the return of spring and a bonus day of sewing are worth a Whoop Whoop.